An excellent agricole for which it is worth splashing out some extra francs: lovely nose, deeper flavours, better body, and in all ways exceeds the cheaper Reserve Speciale from the same company. 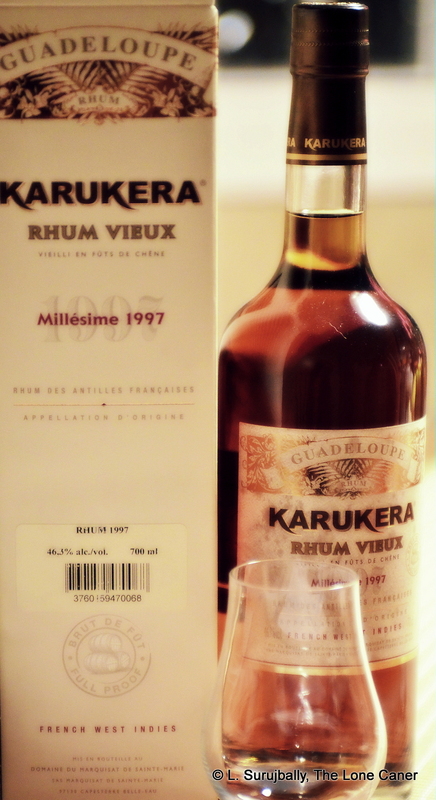 Unimpressed by the blah of the Karukera Rhum Vieux Reserve Speciale, I then decided to take the hundred dollar Cask Strength 1997 off the shelf where I had hidden it from the prying eyes of my wife (she who can spot a shredded receipt from a hundred paces). We don’t see many Guadeloupe rums in Calgary, yet Ralf’s Rum Pages out of Germany lists no less than 12 separate distilleries on the islands, so I was pleased to have another to review. And I wanted to see whether my own snootiness regarding agricoles would continue, or were there really one or two out there which I could enthusiastically recommend. Happily, here was an agricole which in the first stages tempered all my negative remarks made to date (the ageing, perhaps?). For a hundred bucks this rum cost me, I got a simple bottle with a simple label, stowed in a thicker cardboard container than usual (by contrast, note the flimsy packing of all the top end El Dorados). Upon decanting and opening up, a lucious nose stole out: warm, sweet, caramel, mixed in with, but not overpowering, red grapes, cinnamon, and lacking something of the muskiness of molasses. There was a herbal note to it I liked a lot, yet none of this was attacking me the way a 46.3% beefcake such as this normally would have. As before, there is an frustrating dearth of information about this rum. The most I was able to glean was the obvious: made in Guadeloupe by a famous Espérance distillery (founded in 1895) located in the marquisat de Sainte Marie, it is defined by its terroire and has the honourable “appellation d’origine” given for adhering to clear specifications of location and manufacture. The rum itself comes from cane juice milled from cane grown around the distillery, and is matured in small bourbon casks – this lot came out in 1997, but the literature gives no details whether it is, as I’ve noted somewhere in notes I have in my file but whose origin I can no longer remember, actually twelve years old. Maybe that accounted for its somewhat herbal nature, and the overall gentleness of the rum. Note, by the way, that there were no filters and additives added to this bad boy: what I tasted was what I got. That flavour profile was more in tune with agricoles I had tasted before. Yet even here some of the quality I had experienced in the nose came out and mitigated a negative impression. Normally I don’t like the lack of sweetness in the agricole makeup: too much like a pretty flirty lady who is all promises and no follow through, good only in company, never alone (I’ve had a few girlfriends like that…but I digress). With this cask strength offering, I had to concede that Espérance did a fine job with the materials on hand, and a luscious taste of light caramel, fruits (green apples, grapes), vanilla, more cinnamon and flowers came through in a very pleasant combination. At 46% I could not escape some sharpness, true, and the rum was tangy and woodsy as well…just not enough to be distasteful or nasty, useful only in a mix. In many respects the Karukera 1997 reminded me of the Rhum Clemente upon which I vacillated for so long: same phenomenal nose and a bit of a lesser palate. The fade is heated and fiery and smooth and long lasting, and I must say, I was impressed with it. 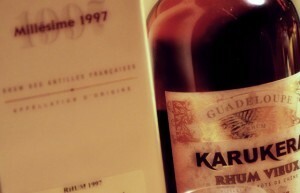 Unlike a fellow distillery on Guadeloupe (Longueteau) which makes more traditional rums using very old steam-driven equipment, Karukera positions itself in a somewhat more exclusive niche market by concentrating on light argicoles made to the exacting AOC specs. This is not quite my thing, as I’ve noted before: I prefer rums to be rums, not light cognac imitators, and my score reflects that. Still, boutique rums have an occasionally undeserved reputation, based too often on reviews like mine where clear preferences in other directions are noted right up front, or overhyped expectations from clever marketers. Here we have a 12 year old agricole rum which is close to the top of the Karukera food chain. It’s a good rum, a smooth rum, and a impressive product from a distillery we don’t see enough of here in Canada. My take for you, reader, is to forget the cheaper Reserve Speciale and go straight for this variant: it’s more expensive, yes, but in this case you really do get what you pay for. And that’s quite something.